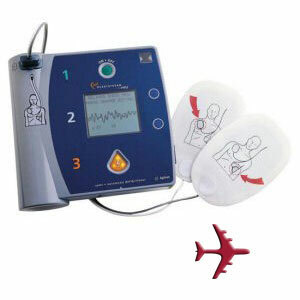 Note: This popular AED has been discontinued by the manufacturer. Other Notes: Aviation battery, 2 sets adult electrode pads, quick reference card. This AED has been discontinued by the manufacturer. Please call us at 800-544-0048 so we can discuss your available options. Tool of the pros; simplicity for the lay responder. The FR2+ has come to be a trusted tool of professional responders and designated response teams in the work place and public settings. Its clean, uncluttered design is optimized for fast, efficient operation and rapid delivery of life-saving therapy. Commands are clear, streamlined, confident, and concise: ideal for responders who are trained, drilled, and ready to save a life now. The HeartStart FR2+ offers features that make hand-off to ALS professionals seamless for maximum continuity of care for the patient. An optional ECG display is available. The FR2+ can be configured to allow ALS responders to switch to a manual mode, giving them more decision-making control. Defibrillator pad adapters enable the pads to remain on the patient when transferring to many popular ALS manual defibrillators from Philips and other manufacturers. But don't be misled by its advanced capabilities. The HeartStart FR2+ is extremely easy to use. Its design is based on years of research, refinement by Philips human factors experts and user testing with the full range of responders from healthcare professionals to lay people. In fact, hundreds of thousands of citizens are already trained and ready to save a life with the FR2+. Optimized for challenging environments. Because of its ruggedness and ability to stand up to temperature extremes and wet conditions, the HeartStart FR2+ is the right choice for harsh, outdoor, or mobile use. It combines natural sounding voice instructions that are loud and clear, with text prompts on a large, bright back-lit display. This makes it ideal if you anticipate its use in noisy or poorly lit settings. And at just 4.7 pounds, it's incredibly small and light-weight so it won't weigh you down. Infant/Child Defibrillation. The FR2+ can treat patients of any age. When equipped with special infant/child defibrillator pads that reduce the energy of the FR2+'s shock, you can safely treat a child or infant in cardiac arrest.